Originating in Finland, the Karelian Bear Dog is a member of the Spitz family. They are highly prized by huntsmen who use this breed to hunt moose, deer, elk, wolf, and hare. Karelian Bear Dog's are capable of hunting over any terrain and in any type of weather. Although closely related to the Russian Laika breeds, the Karelian Bear is more domesticated. The Karelian Bear Dog breed possesses a striking appearance, is attractive, and distinctive. The Karelian Bear Dog is of medium-size, sturdy, and robustly built. They have a demeanor of dignity, bravery, and are fearless. The Karelian Bear Dog is not recommended for inexperienced or first time dog owners. They are not a breed solely intended to be a pet. They will do okay with children and non-canine pets they have been raised with. The Karelian Bear Dog breed is exceedingly protective of thier family, home, and territory, and have a tendency to be aggrssive toward dogs and strangers. They are loyal, sensitive, intelligent, and independent. They are persistent, determined, and energetic. Regular combing and brushing is recommended to remove loose and dead hair and minimize shedding. Bathing should only be done when absolutely necessary. It is important to routinely check the ears and paw pads for debris and maintain the nails. There are no known health issues associated with the Karelian Bear Dog. 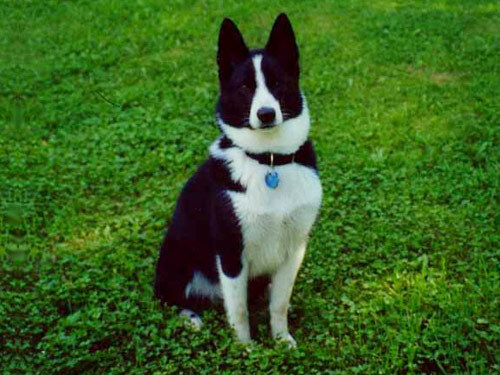 The Karelian Bear Dog is a double coat breed. The coat is weather-resistant. The outer coat is straight, harsh in texture, and of medium length. The under coat is dense, thick, and soft. The hair is slightly longer and more profuse around the neck, on the back, and at the breeches. The ears are lined with dense fur to protect against frost bite. This Karelian Bear Dog breed is an average shedder. The Karelian Bear Dog must have intense and on-going socialization and obedience training. This breed must have a dominant and respectful owner. Karelian Bear Dog's will not respond to harsh or heavy-handed methods. Training must be done with firmness, fairness, respect, and consistency. Karelian Bear Dog's are not recommended for apartment living. They require an inordinate amount of physical exercise and mental stimulation. If they do not receive sufficient exercise and stimulation they will become destructive. The Karelian Bear Dog must have a securely fenced rural setting to roam freely. They thrive on running and hunting. This breed must be securely leashed and muzzled when in public.